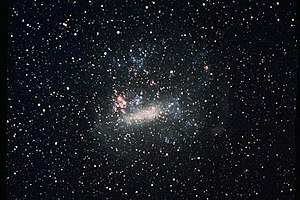 Ultra-compact dwarf galaxies (UCD) are a class of very compact galaxies with very high stellar densities, discovered in the 2000s. They are thought to be on the order of 200 light years across, containing about 100 million stars. It is theorised that these are the cores of nucleated dwarf elliptical galaxies that have been stripped of gas and outlying stars by tidal interactions, travelling through the hearts of rich clusters. UCDs have been found in the Virgo Cluster, Fornax Cluster, Abell 1689, and the Coma Cluster, amongst others. In particular, an unprecedentedly large sample of ~ 100 UCDs has been found in the core region of the Virgo cluster by the Next Generation Virgo Cluster Survey team. The first ever relatively robust studies of the global properties of Virgo UCDs suggest that UCDs have distinct dynamical and structural properties from normal globular clusters. 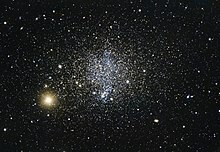 An extreme example of UCD is M60-UCD1, about 54 million light years away, which contains approximately 200 million solar masses within a 160 light year radius; its central region packs in stars about 25 times closer together than stars in Earth's region in the Milky Way.M59-UCD3 is approximately the same size as M60-UCD1 with a half-light radius, rh, of approximately 20 parsecs but is 40% more luminous with an absolute visual magnitude of approximately −14.6. This makes M59-UCD3 the densest known galaxy. Based on stellar orbital velocities, two UCD in the Virgo Cluster are claimed to have supermassive black holes weighing 13% and 18% of the galaxies' masses.